She's one tough cookie. Despite a diagnosis of lymphoma resulting in a bone-marrow transplant that's left her bed-bound in the Children's Hospital, 13-year-old Cookie Topp is going to school, doing her homework and meeting with her friends. She hasn't left the hospital in over a month but she has been in the classrooms of St. Jude the Apostle thanks to her robot VGo. 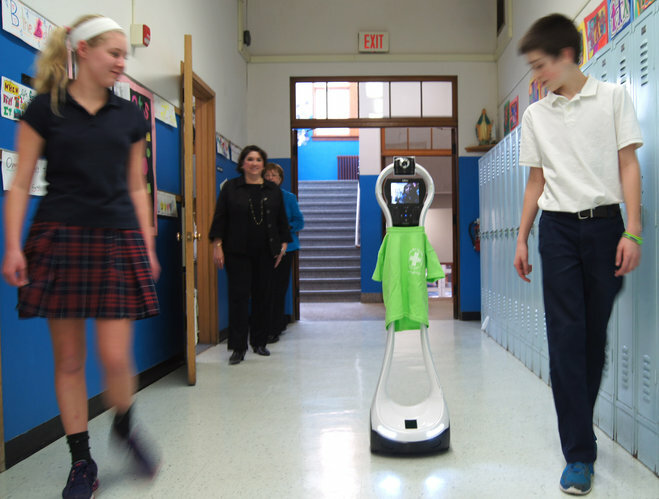 She drives the four-foot tall robot, equipped with a video screen, microphone and speakers, down the hallways of St. Jude and sits in classrooms with her peers all through her laptop computer. Using its screen, she can take photos of her homework, which she then faxes to the school. The robot is made possible by her father's business, SKC communications. While working with the robot is still in its infancy and due to Cookie's condition she can't be in school every day, St. Jude administrators hope to further utilize the robot as her health improves. If all goes according to plan, Cookie will be completely caught up with her grade level over the summer and will be able to return to classes next year. Described by her neighbor and fellow St. Jude student, sixth grader David Kopriva as never showing pain even before her diagnosis, Cookie has kept a brave face on her situation. "She's truly an inspiration to the adults as well," said Administrative Assistant Mary Ferguson. She added, "She has more poise, more strength, more courage and a better spirit than even most adults could muster. That's just who she's always been. She's just a positive person." There's a saying in Cookie's family that she and the community have adopted as a war cry against cancer. It simply goes "Strong like bull" and can be seen emblazoned in purple (Cookie's favorite color) on the wrist bands that students and teachers wear to support her fight. While her health has kept her in bed, forced to take three showers per day and keep constantly clean to avoid infection, Cookie still works with a personal tutor provided by the Wauwatosa Public School system. On the days cookie uses her robot, she not only receives in-classroom education but can see her friends. Using the robot, Cookie can still have a social life such as participating in special school days including dressing the robot in a green shirt for the school's "Let your light shine" day. The ability to pilot a class-attending robot isn't the only help Cookie has gotten. Parent groups, friends, St. Jude and the community at large have donated their help in her time of need. The day Cookie went to the hospital for intensive care, her mother called St. Jude at 9 a.m., telling them she wouldn't be in school that day. Principal Catherine LaDien told her that before she went, she should drive by the school. When LaDien hung up the phone, she immediately contacted teachers, who organized an impromptu poster-making session. When Cookie's mother drove past the school at 11 a.m., every window was filled with students waving and holding posters of support. When local parents heard of her situation, they rallied together to completely remodel her bedroom and bought her a new bed for when she returns home. St. Jude also held a fundraiser to buy her diamond-studded earrings to help her deal with hair loss. Students and parents have been giving her posters and notes that now adorn her room at the hospital. School officials will also call her via the video service Skype during sports matches so she can be as close to the game as possible. "We've given her different presents and stuff," David said, "We got her a blanket and different things like that and she really likes those but I feel like it's almost better for her just to get support." Those driving down Wisconsin Avenue toward the children's hospital may notice green ribbons on the trees. They were placed there to support Cookie and her family. The school is also planning a surprise gift for her for Easter. Those wishing to give her or her family a letter of support are encouraged to contact St. Jude. "The students have just totally learned something from this and really risen to the occasion as much as they can," LaDien said, adding: "People say they are just kids but these children have shown so much character and grace and support. They've really rallied around her."